This past Friday August 22, 2014, Dr. Hayo Meyer, proud member of IJAN and long time anti-Zionist activist passed away. Hajo was unwavering in his conviction and passion that Never Again meant Never Again for Anyone and in his outrage that his experience in Auschwitz is misused by Israel and Zionism to justify the colonization and ethnic cleansing of Palestine. 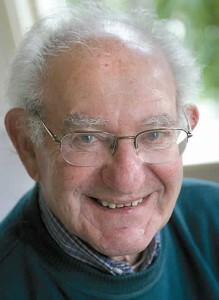 Dr. Meyer was born in 1924 in Bielefeld, Germany. When he was barred from attending school there after November 1938, he fled to the Netherlands, alone. In I944, after a year in the underground, he was caught and subsequently survived 10 months at Auschwitz. Dr. Meyer dedicated himself to countering the Zionist manipulation of the Nazi genocide to justify the colonization of Palestine. He played a leading role on the Never Again for Anyone tour of Europe in 2010, and of the United States in 2011. 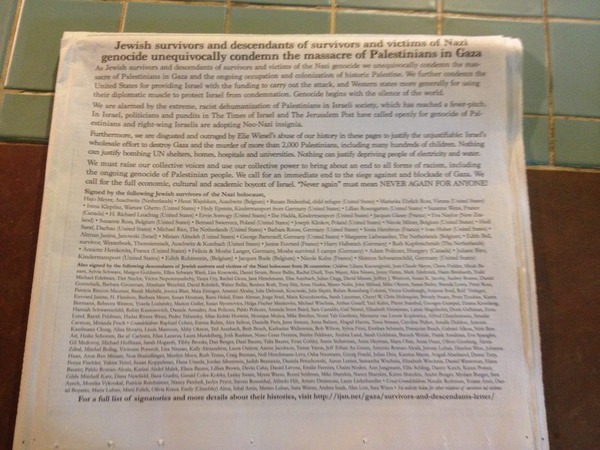 The morning of his death, the following letter from survivors of the Nazi genocide and the descendants of survivors and victims, in response Elie Wiesel's attempt to justify the attacks on Gaza, was published as in the NY Times. Hajo was the first to sign on. Tricycle Diaries: a Win Win for BDS?